Well Folks, it’s that time of year again when we get together to enjoy the last century ride of the year in Texas with our cycling friends. This little ride has started to grow each year and we have to grow along with it. As much as I hate it, growth comes with more expenses. First and foremost we want to keep this a FREE ride and we are happy to announce that after much deliberation, we have managed to keep it a FREE ride to you again this year. This is our annual gift to you, our cycling community. We do want to share that our biggest expense will be providing event insurance, pins, custom bibs, road signs, and all the other wonderful little details that will make this ride better than last year. To offset our expenses and help make this a self sustained ride, please consider purchasing 1 of 50 PdG100 T-Shirts ($20), 1 of 23 Cycling Jerseys ($50), or Pico de Gallo 100 Merchandise available from our annual sponsor, LovelyCreations.com. We are very grateful for all the wonderful people that have offered to volunteer. Please thank them when you see them. I hope you enjoy your time on the route this year and have a safe and wonderful time with your friends. 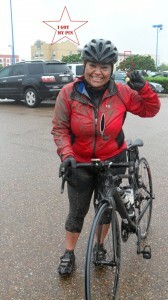 After riding the long, rainy, cold, and muddy 100 miles, Nelly G Hernandez got her 2011 Pico de Gallo 100 Finisher’s Pin. Parking: Lowe’s Home Improvement west side of Parking Lot. Restrooms: Inside Lowe’s Home Improvement. Doors open at 7:00am (30 min before ride starts). Entry Fee: What entry fee? It’s Absolutely Free!!! It’s just a long fun route to complete with friends and meet other cyclists! Register now to provide participant information, emergency contact information, sign terms and conditions, and to be counted towards a Pico de Gallo finisher’s pin.